Difficulty Notes: My ascent route was moderate with some steep slabs and the descent was easy / moderate with scree and slabs. Routefinding is key to keeping things easy / moderate on this mountain. 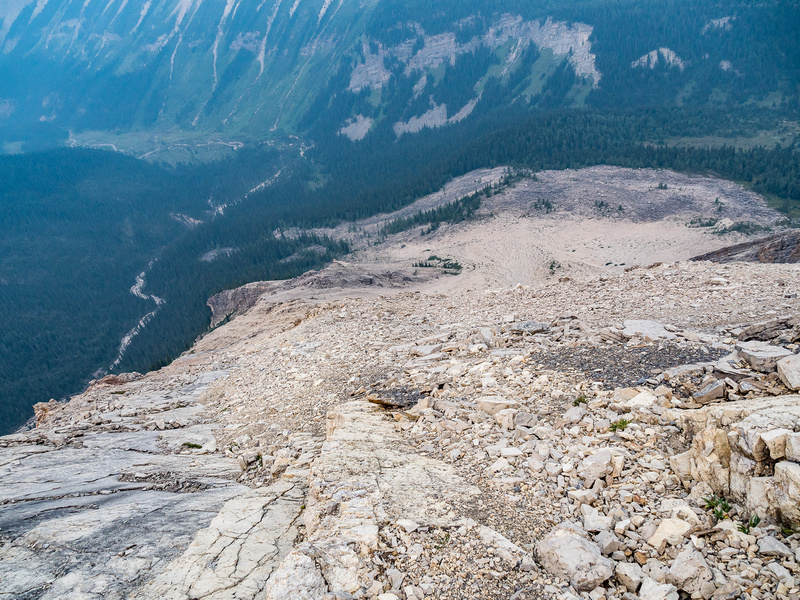 After a couple of very long and full days spent on a 5th recorded ascent of Mount McConnell, deep in the heart of Banff National Park, Phil Richards and I awoke at 05:00 on Friday morning, August 17 2018 with tired bodies and minds, unsure of our abilities to ascend another peak before exiting. I was feeling much better than I had a right to be, but Phil was clearly not feeling the stoke for another peak on this particular day. His head cold from earlier in the week was back and his body and mind were not impressed with him for even considering it. I set about making my morning coffee and choking down some breakfast while we discussed the situation in the early morning darkness. It didn’t take long to conclude that I would give Tilted Mountain a shot and Phil would sleep for another hour or two. 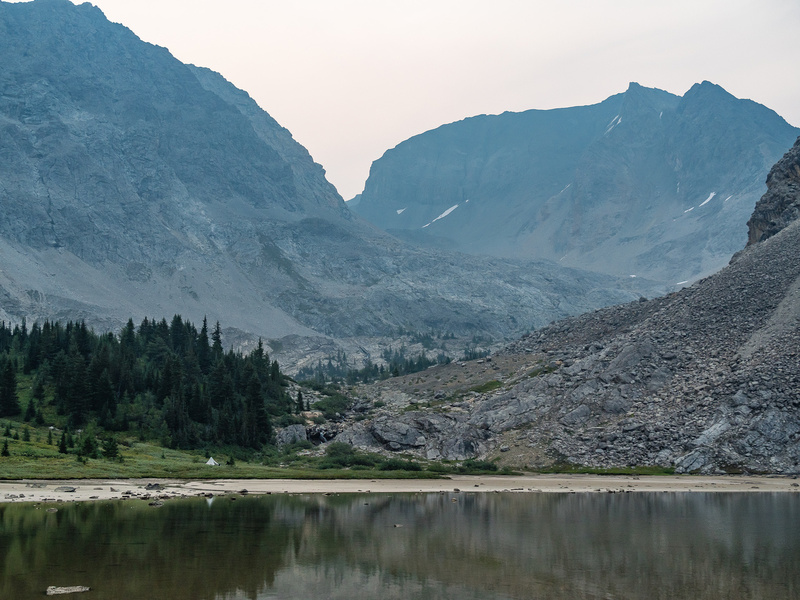 At Tilted Lake – our bivy site at the far end. I had zero beta for the peak, which was fine, but was a bit leery of it for some reason. It had looked pretty slabby on the approach to our bivy the evening before and I know that slabby peaks can have a bite if you go anywhere off route. The only beta I did have on Tilted was a Facebook post from Paul Zizka in 2017, encouraging more folks to ascend it. He posted in a scrambling group, so I assumed there must be a scramble route somewhere on the mountain – the only question was, where? On our approach we both commented that the SW end of the mountain looked most laid back, but I didn’t feel like traversing there in the morning darkness, so I ascended straight up scree slopes under a series of cliffs and slabs on the NW end instead. It was fairly dark but I could see an obvious line up scree and slabs next to the cliffs and simply went for it. 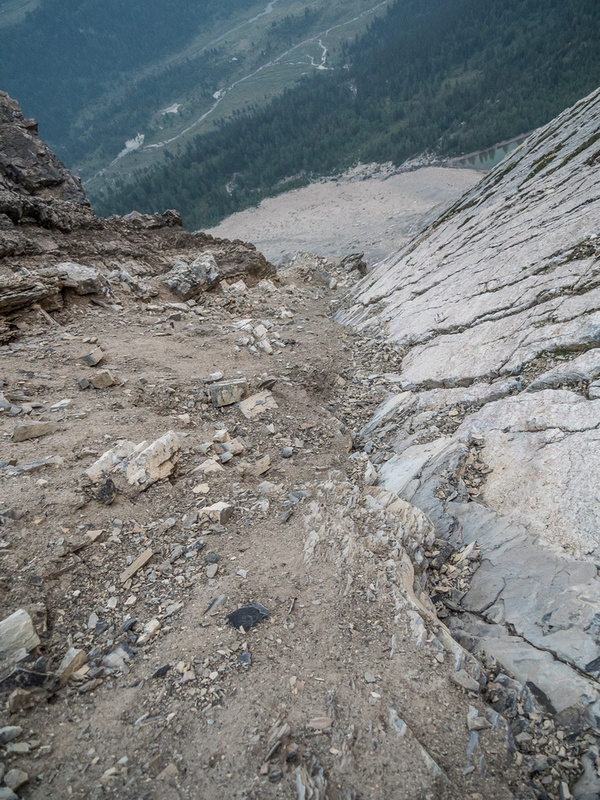 Looking down my ascent line – it’s not exactly “easy” scrambling terrain. As dawn slowly broke around me, I could see that the forest fire smoke was going to be brutal on this particular day, completely ruining any shot at good early morning views. Oh well. Tilted isn’t a very grand objective anyway – this justified our choice not to go for Lychnis until clearer skies and better conditions presented themselves. 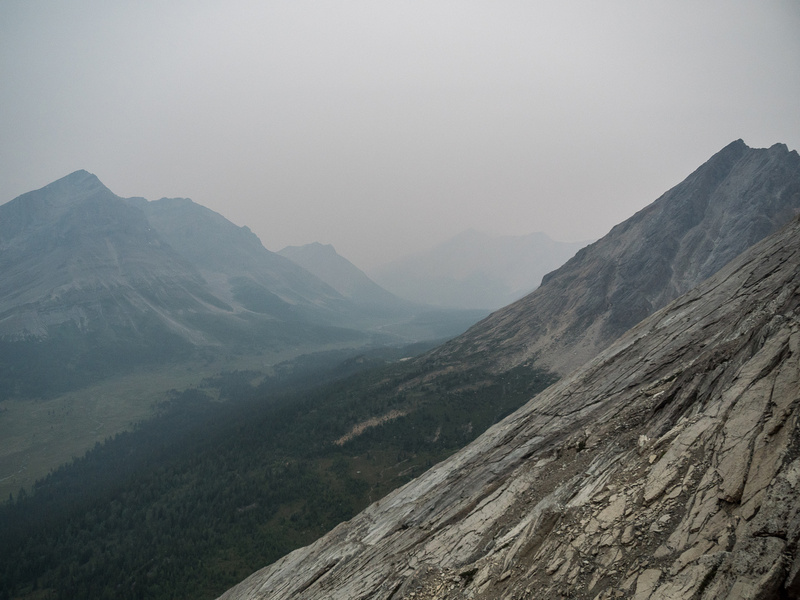 The terrain steepened as I climbed, but I could always see an obvious line up cracks in the slabs. Slab scrambling is fun, but can be tricky because it’s very easy to get suckered into difficult, exposed terrain. There were several times on ascent where I was looking down my line wondering how easy it would be going the other way. As I neared the summit ridge I also noted that I was moving quickly and that I’d have at least 500m of mostly horizontal traversing to attain the summit. 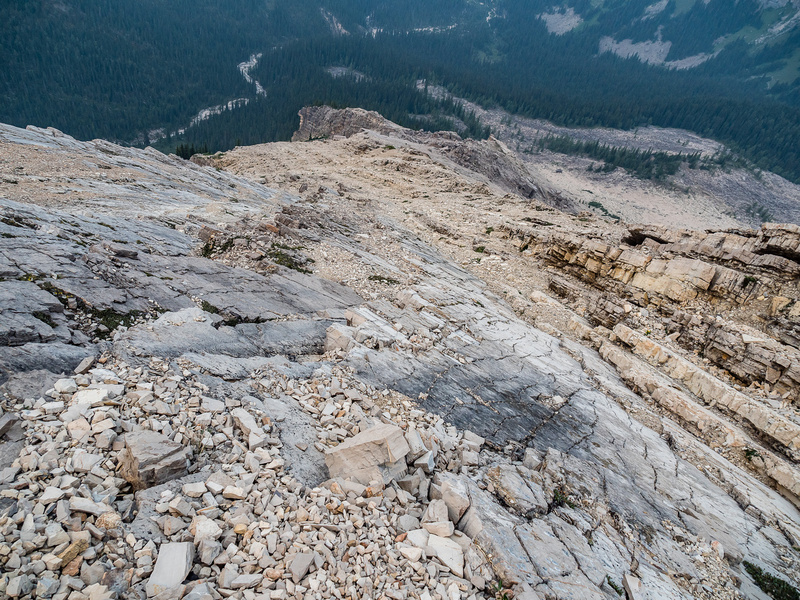 This wasn’t a huge deal, but the summit ridge was looking pretty fierce – knife edged and VERY loose. My day improved dramatically as I popped over the summit ridge and discovered a scree sidewalk leading along it towards the summit on the opposite (east) side of the knife edge! When does that happen?! I couldn’t believe my good fortune and whooped out loud in the still morning air before scampering along the sidewalk towards the distant high point. Another observation improving my mood was the realization that the SW slopes looked pretty laid back compared to my ascent line and would almost certainly be my chosen route of egress. 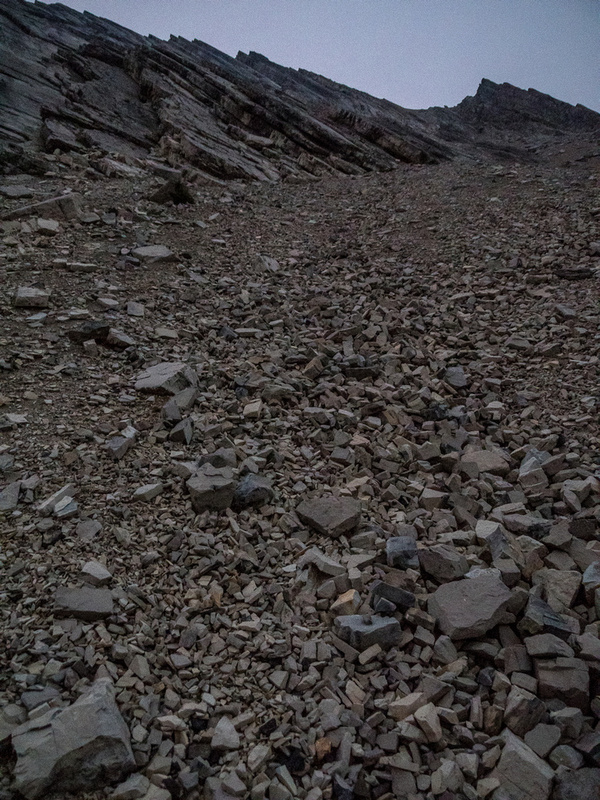 Looking back along the scree sidewalk that gave easy access to the summit which is behind me here. My sidewalk vanishes, only to reappear about 15 feet beneath me to the left. Looking down my descent line on the west face – much easier than the ascent line was but pretty darn loose. After an unsuccessful search for a register and even more unsuccessful attempts at getting photos from the summit, I started my descent of the SW side of Tilted Mountain. I don’t normally love descending routes “blind”, but I could see 95% of the route and it looked pretty easy compared with my ascent line so I took a chance. 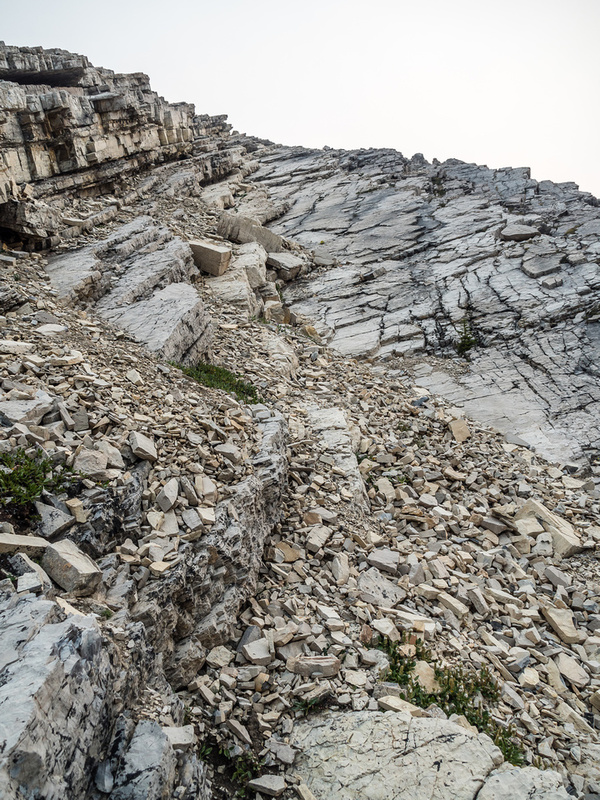 Everything went great and soon I was plunge-stepping scree down and across the lower west face of the mountain in a circuitous route back to the unnamed lake and our bivy. 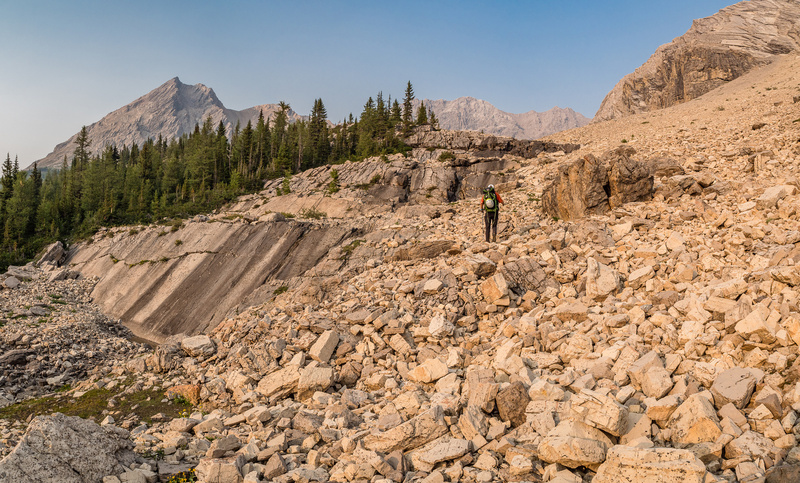 The scree and boulder slog back to the lake was a bit annoying but I was feeling pretty good from my successful scramble and luck with the summit ridge sidewalk, so I didn’t care much. A gorgeous early morning hike back around the unnamed lake with our bivy just visible at center and Tilted Mountain looming above. We packed up camp while I brewed another coffee to power me through the last 18km or so of our trip back to the parking lot. As I was folding up the mid, Phil whispered something urgently. “What?”, I asked. “BEAR!”, he replied! 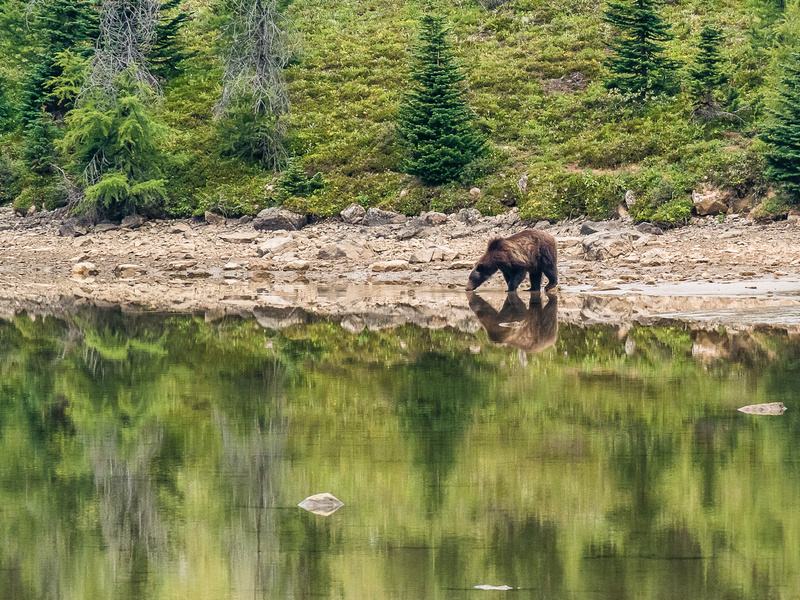 In a highlight moment for the entire trip, we spent the next 15 minutes or so watching a large Grizzly tear up the earth next to our camp in the alpine meadows around the lake shore. We yelled in order for everyone to realize who was all tucked into this small valley and it took a few minutes before the large bruin turned towards us and started walking in our direction. Bears don’t have great eyesight, and after peering intensely towards us, he dismissed us as mere sideshow to his breakfast routine, and continued trashing the meadow with gusto. The coolest moment was when he took a break and wandered down to the lake shore (where I’d just walked past quietly a few minutes before) and took a deep, refreshing drink from the same water I was boiling for my morning coffee. 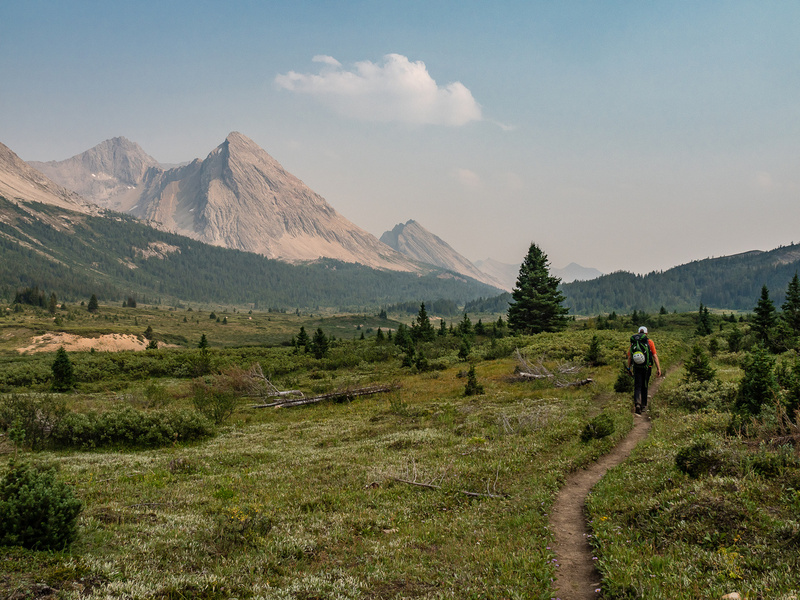 It was a magical Skoki morning, but I do admit that the presence of a bear did speed up our morning packing a bit. 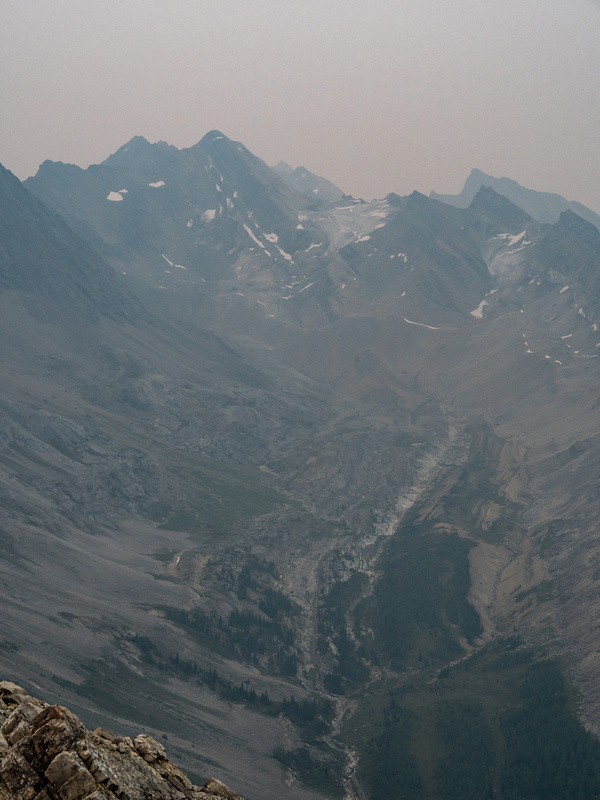 A very special Skoki moment near our bivy. 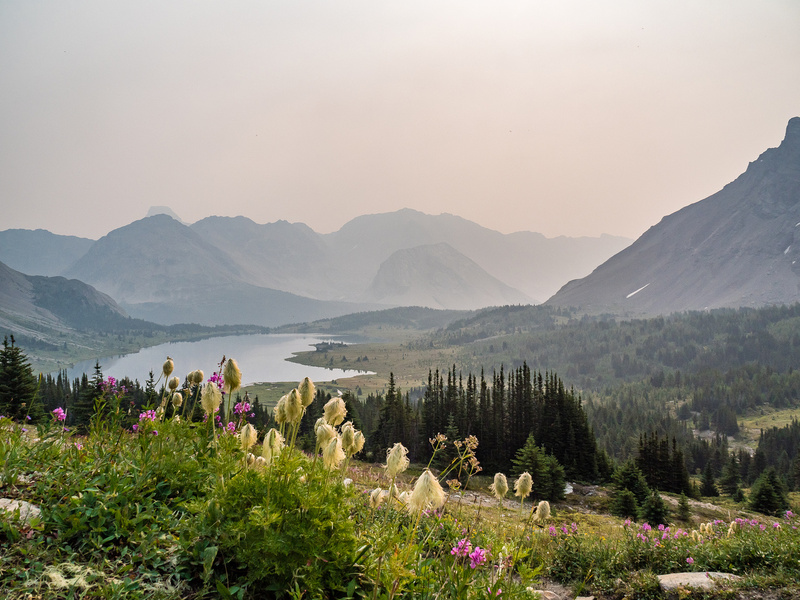 Late summer flowers as I glance back over Baker Lake to Tilted Mountain with Lychnis rising over it from Baker Pass. 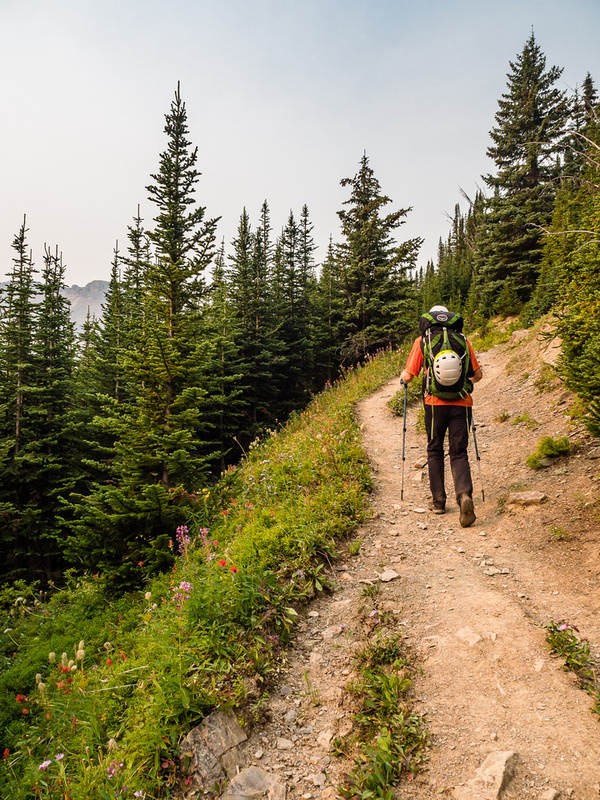 We exited the valley on the opposite side of the lake to the bear and proceeded down the access headwall (bushwhack) to the Baker Creek Trail. 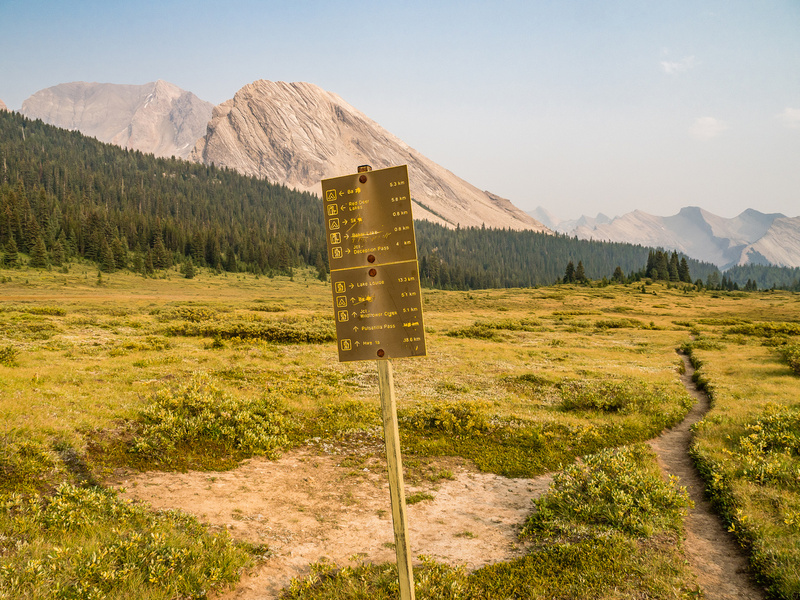 From there it was a trudge along various segments of Skoki highways to Boulder Pass and then down to our bikes. 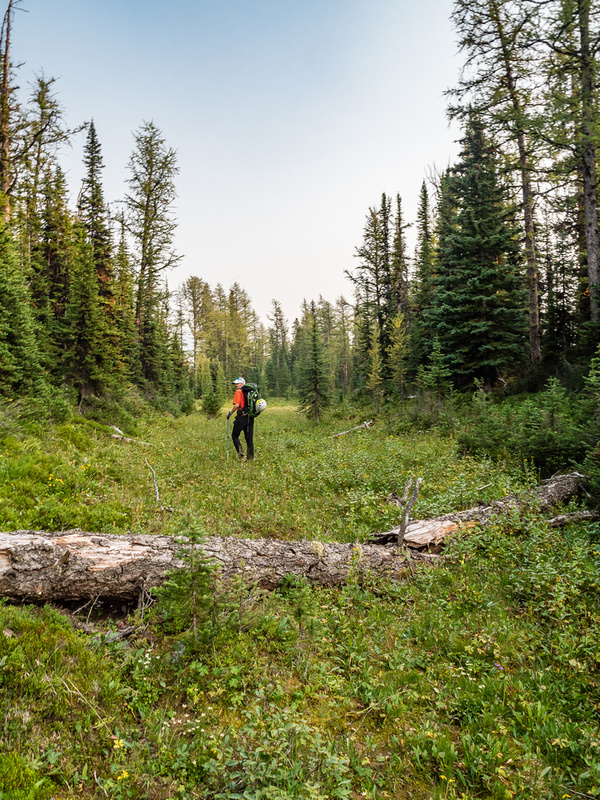 The amount of height gain from Baker to Ptarmigan Lakes was surprising – I remembered doing that years earlier only while we were doing it again. 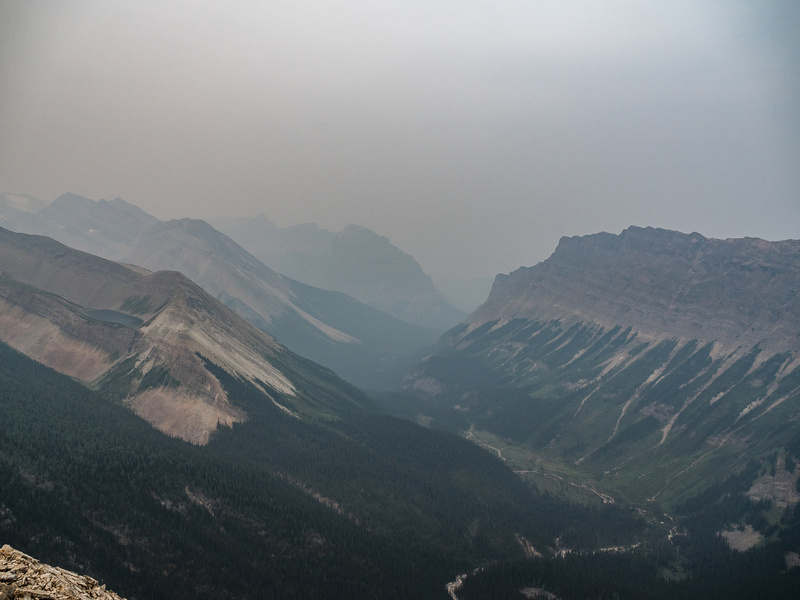 Views were limited due to the smoke, but this area is so special it always presents some nice panoramas. Passing Oyster (oos on the left) and heading for what we assumed was Tilted at foreground left. We realized soon that Tilted is at center distance. Looking back along the impressive Oyster Peak which I scrambled as part of a 72 hour peak binge in early September of 2005. Staring down the Baker Creek drainage and the Back Creek Trail with Tilted and Lychnis at left and Brachiopod and Anthozoan at right. 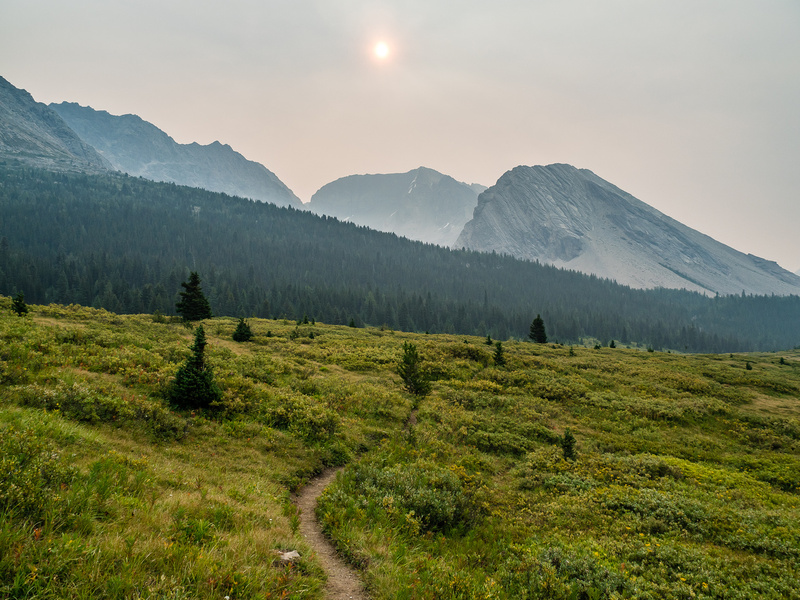 On the Baker Creek Trail heading towards Pulsatilla Pass and the Wildflower Campground with Tilted Mountain and Mount Lychnis at left. Will this day ever END?! Ascending a small headwall under the unnamed lake. Tilted Mountain looms above us out of sight to the right here. Finally at the lake, but now we have to rock hop to the far NE end to set up our bivy. Finishing up our rock hop and looking for a good bivy spot which we found just to the right here. The sun is trying to shine through the smoke. Looking up my line early on Friday morning after rounding the NW cliffs above camp. You can see how horribly loose this mountain is as well as the amount of slabby terrain that you can get lost on. Looking down my ascent line - it's not exactly "easy" scrambling terrain. 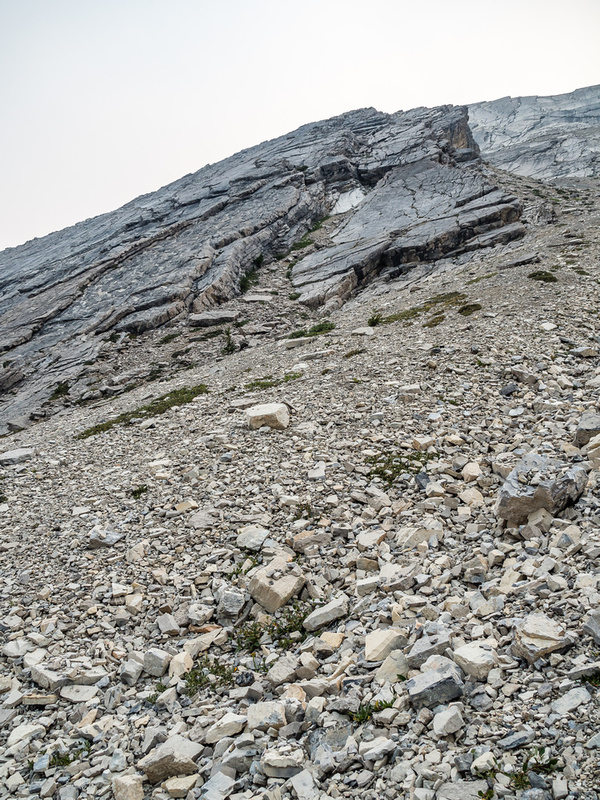 Looking towards Skoki Mountain at center distance with Fossil at left and an unnamed summit at right. No views today, unfortunately. 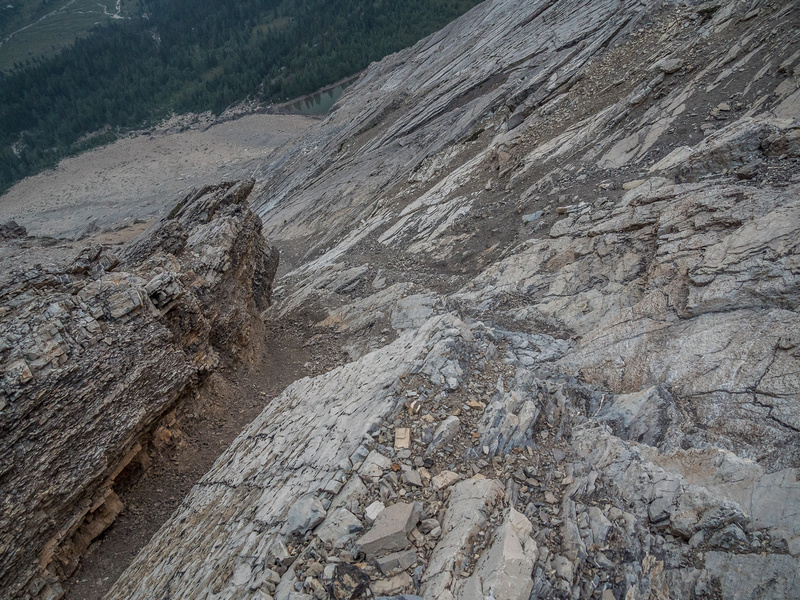 Riding the line between scree and slab, looking down my ascent. Looking along the hidden scree sidewalk feature towards the summit of Tilted Mountain. Looking back along the scree sidewalk - I can't believe how lucky this feature was! Baker Lake visible at distant left. 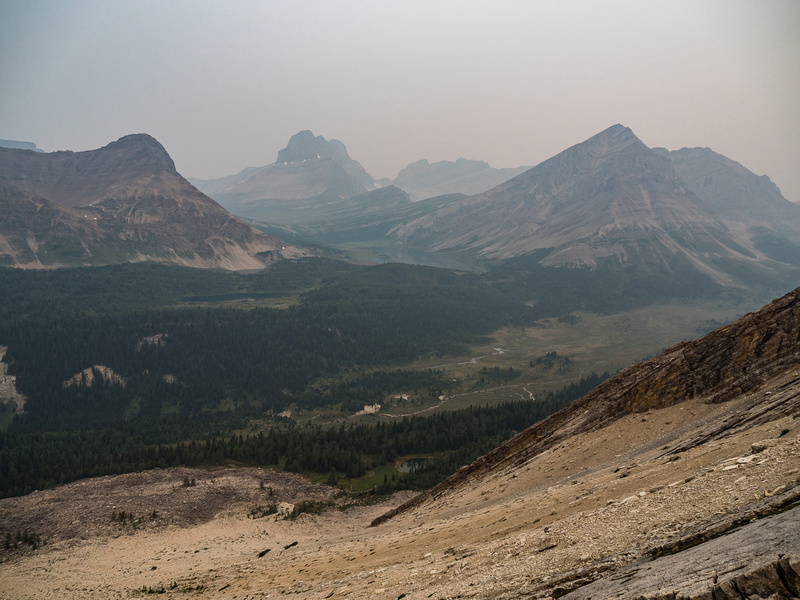 It's a smokey, gray, depressing summit panorama but it's all I could do... Summits "visible" include Anthozoan, Brachiopod, Ptarmigan, Fossil, Skoki and Lychnis (L to R). Views to the south include Lychnis and tantalizing views towards the Bonnet Icefield at center left. The Bonnet Icefield is located up this valley and beyond. I'm not sure there's any named summits visible here but Hickson Peak is somewhere on this line. A "view" south down Baker Creek past Anthozoan Mountain (R) towards Bulwark Peak (C) and Mount Avens (L). Looking down my descent line on the west face - much easier than the ascent line was but pretty darn loose. Looking back up my descent line I realize that it's still a bit of a confusing mess. Pick your poison I suppose. 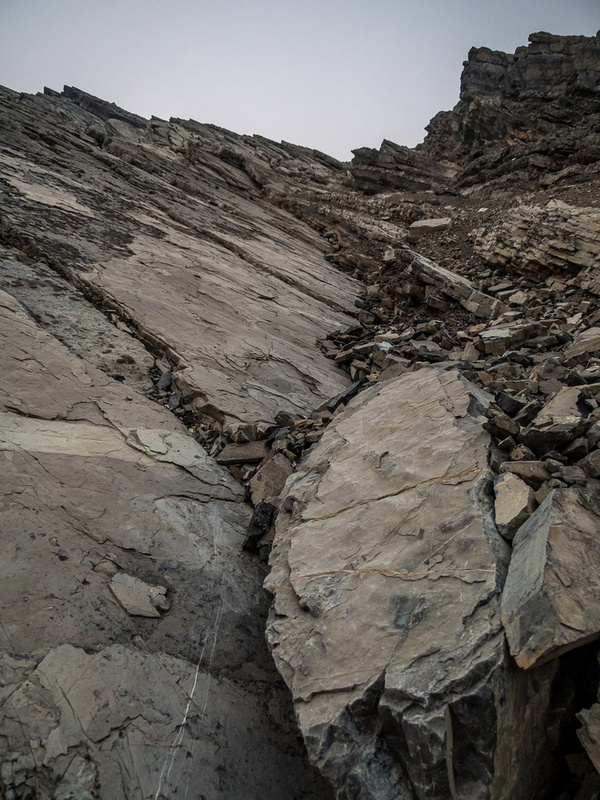 Scree or slabs or both? Your choice on this little mountain! Smokey views past Brachiopod over Baker Lake towards Ptarmigan looming over Packers and Deception Passes. Fossil Mountain at right. Looking up another descent line I noticed on ascent - this one would have worked well too - past the dark slabs down a steep scree gully at right. 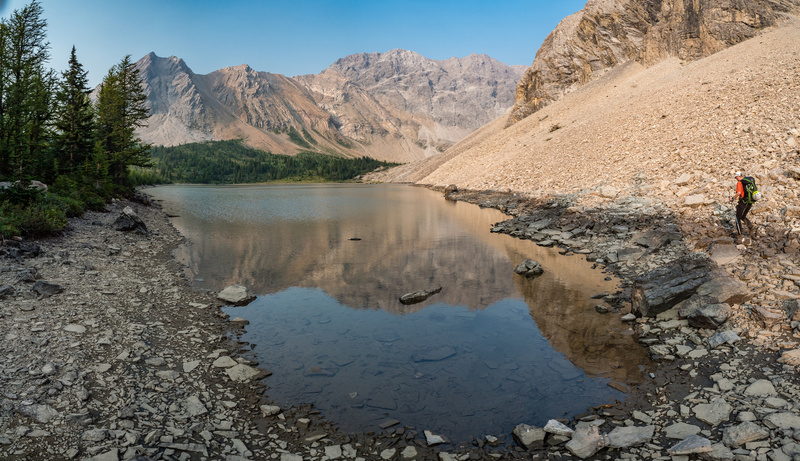 A gorgeous early morning hike back around the unnamed lake with our bivy just visible at center. Lychnis rising at center left and Tilted looking impressive at center right. Our bivy with Lychnis Mountain rising far above. A very special Skoki moment. Phil leaves our bivy as the sun rises over the Lychnis Col. Looking back at Lychnis rising over Tilted from the Baker Creek Trail. 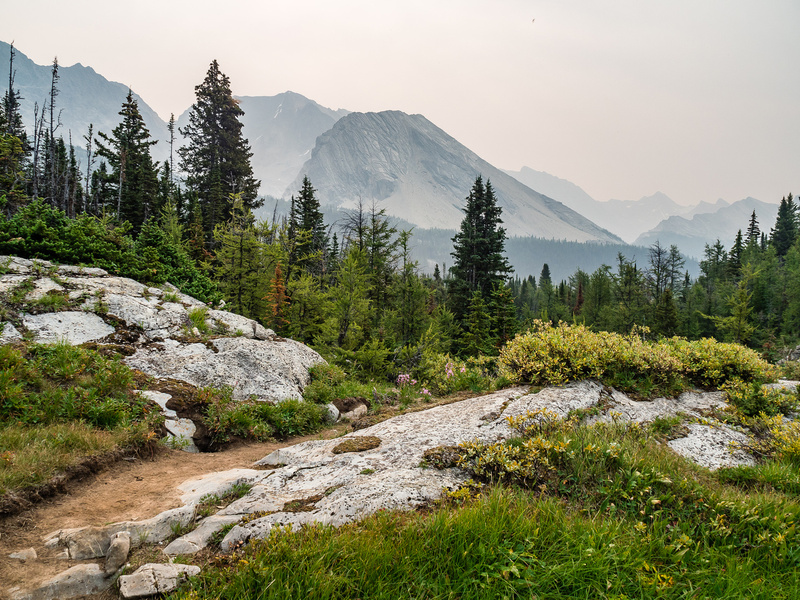 As we gain height from the Baker Creek to Baker Lake trail, Tilted becomes less and less of a defined peak. 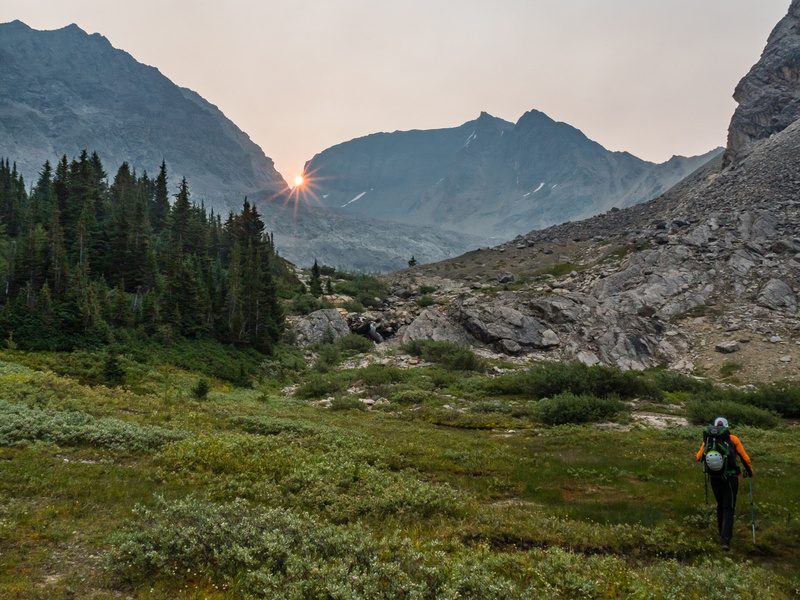 Looking back over Baker Lake as we ascend towards Ptarmigan Lake - the sun struggles to get through all the smoke. Late summer flowers as I glance back over Baker Lake to Tilted Mountain with Lychnis rising over it. 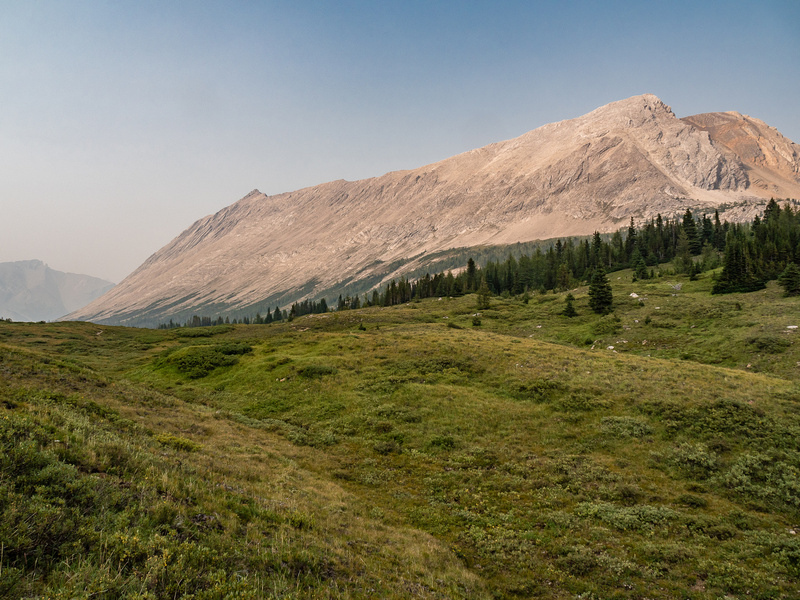 Hiking towards Ptarmigan Lake with Redoubt Mountain at left and Ptarmigan Peak rising above Phil at right.